It is freezing and I am stewing. As already established on this blog, I am aware that freezing is a relative term so please, don’t all you Midwesterners jump on me at once. It has dropped into the 40s at night this week and for Los Angeles, by definition, that is freezing. Not to mention that I just returned from Wisconsin where it was, ahem, in the low 40s at night. As far as the stewing is concerned, it mainly centers on meat, not my emotional state of mind – a much more delicious alternative. I just can’t help myself; I don’t want to turn my oven off in this cold weather. Already there have been soups and stews; braises and bread baking; even pastries on one choice afternoon. 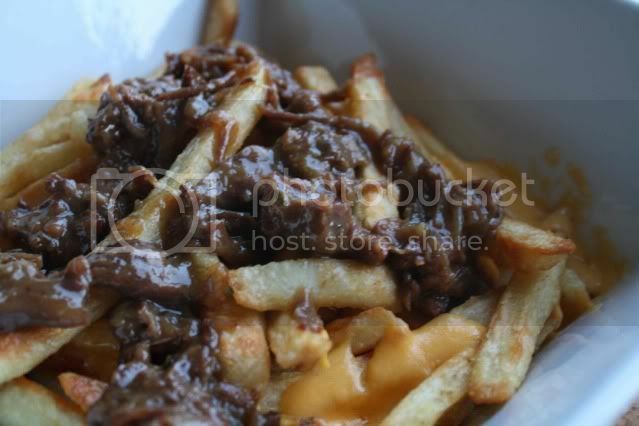 The most celebrated winter dish, new to my kitchen this year, is poutine. It’s only been celebrated by one person so far, but he has done enough on his own to earn it that designation. Poutine sounds pedestrian in theory – fries, covered with melted cheese curds, covered with gravy – but the right gravy can elevate the dish to something else entirely. I originally created a poutine recipe of my own to avoid the $120 dinners at Animal that were threatening to turn into a weekly occurrence. My boyfriend had it bad for poutine and unlike the Canadian creators of the dish, we seemed hard-pressed to find it on many menus. As we would start planning for our weekend and the inevitable question of where to eat came up, I could see his eyes start to glaze over as he thought about the dish and subsequently pleaded with me to go to Animal, just one more time. Not that I have a problem eating at Animal every weekend. It is by far my favorite restaurant in L.A. at the moment, but my pocketbook and my arteries started begging for mercy. So, into the kitchen I went determined to save our health and our finances and according to the boyfriend, I succeeded. He even thinks my poutine is better than Animal’s. I’m not certain about that but it is good enough to satisfy his craving and easy enough that I think you’ll enjoy making it at home. Use this recipe only as a guide. I have varied it each time I’ve made it according to what I already had on hand and it is still delicious, even with modifications. Make sure you use real deal cheese curds - Trader Joes sells them if you have trouble locating them - and feel free to make your own fries, I just like to make the process slightly easier by using the frozen variety. I make my gravy with oxtails because that’s what Animal uses, but if you have a favorite recipe, by all means have at it. And finally, apologies in advance if this is your first introduction to poutine. I take no responsibility for resulting addictions. Sprinkle the oxtails with salt and pepper. Heat the olive oil in a Dutch oven over medium high heat and brown the oxtails on all sides. Remove to a plate. Add more oil if the pan is dry and sauté the onions, celery and carrots for five minutes, until just starting to soften. Return the oxtails to the pan and add the stock, bay leaf and thyme. If the stock doesn’t almost cover the oxtails, add water until the tops of the oxtails are just peaking out of the stock (but no more than two cups of water). Cover and place in the oven. Cook for three to four hours until the meat is tender and falling off the bone. When the meat is finished, turn off the oven, remove the oxtails to a plate and set the pan over medium high heat. While the remaining stock is reducing (it should already be significantly reduced after four hours in the oven) pick all of the oxtail meat off the bone. When the stock is looking thick and gravy-like, add the meat to the gravy to warm through. If you haven’t already, and you should have already, make your French fries. Transfer the French fries to an oven-safe serving dish and sprinkle with cheese curds. Place in your cooling oven for five – 10 minutes until the cheese is melted. Top the fries with gravy and serve while piping hot. I can't believe that you've eaten this and lived to tell about it! It looks heart-stoppingly rich...and scrumptious. One bite would do me in, I think. We've still not gone to Animal...I think we need to! Wish there were a picture. Sounds both amazing and kinda scary. Like the best of regional/home-made cooking always is. I want some of this stew now! Have you any idea how good this sounds? Oh, my! Yummy; fortunately we have poutine on every corner and even McDonald's gives it a whirl here. Best Poutine is in a casse-croute (small road side stands of which there are hundreds) in the Province of Quebec. MKET--Ottawa Ontario. Wow that does look awfully addictive! Learning how to make it might be dangerous! Pure comfort poured fries, now that sounds like my kind of recipe. Thanks for the inspiration. Mmmmmm poutine!!!! classic canadian favorite of mine that I grew up on!
! It looks heart-stoppingly rich...and scrumptious. One bite would do me in, I think. We've still not gone to Animal...I think we need to! Though I've heard about it many times, I have yet to try poutine. Yours looks delicious - definitely one of the most tempting descriptions I've ever read. Hello from Iowa, where it is -12F at night!